Dr. Ivan Martinez received his Doctorate in Veterinary Medicine in 1999 at the University of Barcelona College of Veterinary Medicine, in Spain, where he also completed a one-year rotating internship in small animal medicine and surgery. 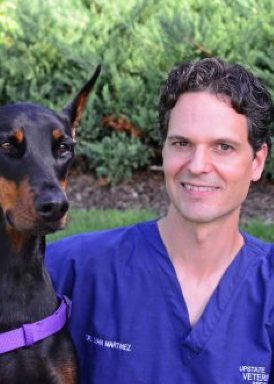 He performed a second rotating internship at the Ohio State University Veterinary Teaching Hospital in 2002 and went on to complete residencies in both internal medicine (2005) and oncology (2008) at Michigan State University. He is double boarded in small animal internal medicine and medical oncology. Following specialty training, he moved to South Carolina and joined Upstate Vet as a medical oncologist until 2014, and after a brief span of two years practicing at Angell Animal Medical Center in Boston, he is now returning to Greenville to rejoin Upstate Vet. His clinical interests include multimodality management of cancer in small animals with chemotherapy, radiation therapy, and more recently available targeted therapies. Outside of work, Dr. Martinez enjoys spending time with his wife, two young children, two Dobermans, one cat, and one horse. He likes hiking, jogging, kayaking, motorcycle riding, and enjoying the sun.